Theresa May, the British prime minister, went to Brussels on Thursday to meet with leaders from the other 27 EU countries at the European Council – and discuss a short delay to Brexit, which is due to happen on March 29. In a letter sent to the EU on Wednesday, the British PM sought a three-month extension to Article 50, the formal process for leaving the bloc. 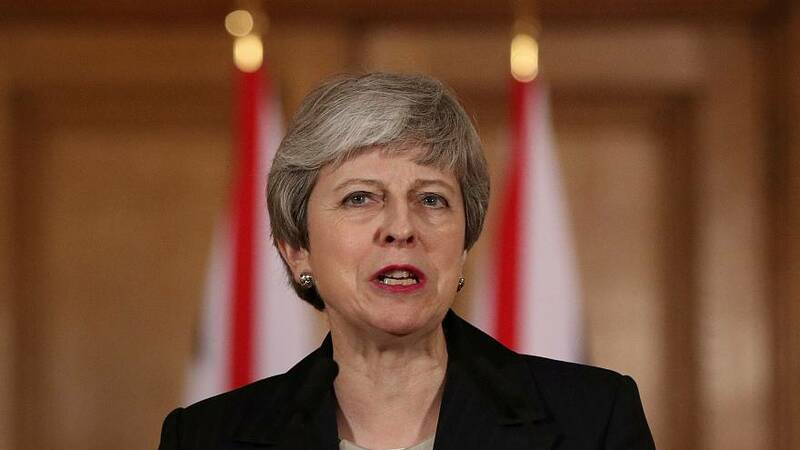 On Wednesday night, addressing the British public from Downing Street, May said that she was "not prepared to delay Brexit any further than the 30th of June". "A short extension would give parliament the time to make a final choice that delivers on the result of the referendum," Theresa May said on arrival in Brussels. "What is important is that parliament delivers on the result of the referendum and that we deliver Brexit for the British people. I sincerely hope we can do that with a deal." There is no guarantee that the EU will accept an extension, which needs to be approved unanimously by the other 27 governments. The condition for a short delay is for the British parliament to vote for the Withdrawal Agreement deal that May struck with the EU, according to EU Council president Donald Tusk at a press conference on Wednesday. May's spokeswoman said she was due to meet French President Emmanuel Macron ahead of the summit. France has threatened to reject May's request for a Brexit delay if she cannot provide sufficient guarantees that the British parliament will approve the UK-EU divorce deal. "We respect the vote of the British people... but we have to be clear: we can discuss and agree an extension if it is a technical extension in the case of a yes vote (in the UK parliament). In the case of a 'no' vote, it will guide everybody to a no-deal, for sure," the French president said before arriving for the talks. "With regard to the date of June 30, we have to take into consideration that we have European elections in May," said German Chancellor Angela Merkel. She has said that she would "fight to the last minute" to avoid a no-deal Brexit. Dutch Prime Minister Mark Rutte said his assumption was that EU leaders would vote yes in principle to an extension. "First, the ball has to be in the court of the British parliament. They first have to say 'yes'. If the British parliament would say yes, lock stock and barrel... then Europe understands that technically you need time to implement everything in laws," he said. "We need to cut the entire British establishment a little bit of slack on this and suppor their request... for a short extension. No deal will only ever be a British choice," said Irish Prime Minister Leo Varadkar. However, he added that there could be no series of "rolling cliff-edge" extensions. Other leaders – including those from Austria, Poland, Lithuania and Sweden – spoke in favour of allowing the UK more time. However, several have expressed concerns over the impact of a British extension on the European elections. The outcome is highly uncertain with only eight days to go until the UK is due by law to leave the EU. The British parliament has twice rejected the withdrawal deal negotiated by London and Brussels, and approved by the other 27 EU governments. British Foreign Secretary Jeremy Hunt said on Thursday that the European Union could hold an emergency summit next week, to offer a Brexit extension with potentially onerous conditions such as holding another referendum. He added that the government did not yet know whether the exit deal would be brought back to parliament next week. Northern Ireland's Democratic Unionist Party (DUP), on whose support May's government depends in parliament, has said it is not any closer to backing the Brexit withdrawal agreement. UK financial services minister John Glen has said that the sector has every right to feel frustrated with Britain's failure so far to secure a divorce settlement with just a week to go before Brexit Day. British Labour leader Jeremy Corbyn was also in Brussels on Thursday to discuss an "alternative" Brexit plan with EU leaders. After meeting the EU's chief Brexit negotiator Michel Barnier, he vowed to continue trying to renegotiate another Brexit deal. "Our determination is to find an agreement, which means we prevent a no-deal Brexit, and that we have a fugure constructive relationship with the European Union that could be negotiated during an extension period," Corbyn told reporters. "We have done what I believe the government ought to be doing, which is instead of bringing back a twice-rejected deal to the British parliament, looking for a constructive alternative." In a leaked memo, British government officials confirmed the UK is expected to fully start implementing its planning for a no-deal Brexit next Monday because no delay to the scheduled departure of March 29 will have been agreed in time. Euronews's Political Editor Darren McCaffrey told Good Morning Europe that agreement on a Brexit delay at this summit was highly unlikely. “The commission and the council have complained that the letter they received from the British Prime Minister came way too late for them to make a decision,” he said. Watch Darren McCaffrey's briefing in the video above.